Carbon is the key element in all living things. It continuously cycles through the earth’s plants, animals, atmosphere, land, and oceans. The vast majority of carbon is stored in sedimentary bedrock and seawater. 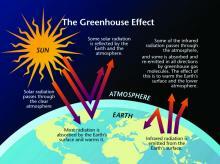 At current levels, atmospheric carbon threatens to alter climate conditions on Earth. Carbon dioxide (CO2), often called a "greenhouse gas," traps heat within the atmosphere in much the same way as glass traps heat in a greenhouse. The accumulation of greenhouse gases has lead to rising global average temperature which, in turn, has led to changes in precipitation patterns, storm severity, and sea level. A high level of uncertainty exists as to the magnitude of projected changes. This phenomenon is commonly referred to as "climate change." Technological advances and conservation measures are needed to reduce the human-caused contribution of atmospheric carbon. Technological innovations that may one day transform our energy sources are already in place and will likely become more widespread in the future. Alternative methods include wind, solar, and nuclear power. The use of these sources could eventually reduce or replace the combustion of fossil fuel, although significant challenges must be overcome for them to become established in the United States at large. Carbon is stored in forests and "carbon markets" are financial instruments used to counteract emissions through the conservation of forest land. Specifically, landowners may be paid to keep their forests intact. In the short term, a 25 percent decrease in atmospheric carbon could be achieved by voluntary conservation measures such as turning off home computers when not in use, replacing light bulbs with compact fluorescents, and driving less in more fuel-efficient vehicles. The earth's atmosphere is a mixture of nitrogen (78 percent), oxygen (21 percent), and trace gases (1 percent). CO2, a trace gas, and other greenhouse gases including methane, water vapor, and nitrous oxide are important because they form a layer in the atmosphere which prevents infrared energy (heat) from circulating back into space. Historically, natural fluctuations in atmospheric CO2 occurred due to temperature fluctuation or volcanic eruptions. Since the mid-1800s, however, atmospheric concentrations of CO2 have risen at a much faster rate than at any time within the previous 650,000 years. The 20th century, especially, has seen massive increases in emissions due predominantly due to increased combustion of fossil fuels. To release their stored energy, fossil fuels are burned to serve growing energy needs such as electricity, transportation, and manufacturing. During the combustion process, a variety of gases and particulates are released into the atmosphere. Primary releases include carbon, sulfur, and nitrogen. Carbon molecules combine with water vapor to form atmospheric CO2. Carbon is cycled on land through various processes. Trees and all other plants absorb carbon dioxide (CO2) through photosynthesis and store the carbon-based sugars in their trunks, leaves, and roots. On the forest floor, carbon is pooled in leaf litter. Soils store carbon in organic matter made up of plant and animal materials in various stages of decay. Coal, oil, and natural gas, formed hundreds of millions of years ago from the decomposition and remains of organisms, store carbon beneath the earth’s surface. Lastly, sedimentary rock stores large amounts of carbon in deposits of limestone, dolomite, and chalk. All living organisms (plants, animals, fungi, and bacteria) release CO2 through the process of respiration and decomposition. While changes in land use have resulted in the release of carbon to the atmosphere, the most significant release has been through the extraction and combustion of coal, oil, and natural gas. Ocean organisms also use CO2 in the process of photosynthesis. Sea creatures feed on carbon-rich plants and release CO2 into the water through respiration and decomposition. Carbon from the remains of aquatic plants, animals, and plankton dissolve or is buried in sediment on the ocean floor. Deep ocean water and its underlying bedrock also comprise a rich carbon sink. Additionally, surface waters chemically react with atmospheric CO2. The rate at which oceans uptake atmospheric CO2 varies with water temperature and wind-driven currents. The warmer the surface water becomes, the harder it is for winds to mix surface layers with deeper layers. Stagnant waters support fewer plankton and CO2 uptake from photosynthesis slows. In short, stratification decreases the amount of carbon the ocean can sequester. Climate Change, Overview of Greenhouse Gases, Carbon Dioxide Emissions, U.S. Environmental Protection Agency, March 2010, http://www.epa.gov/climatechange/emissions/co2.html. How Fossil Fuels were Formed, U.S. Department of Energy, Office of Communications, October 2008 http://www.fe.doe.gov/education/energylessons/coal/gen_howformed.html. Miller, Peter, “It starts at home,” National Geographic, March 2009, http://ngm.nationalgeographic.com/2009/03/energy-conservation/miller-text. Riebeek, Holli, "The Ocean’s Carbon Balance," NASA's Earth Observatory, June 2008, http://earthobservatory.nasa.gov/Features/OceanCarbon/. U.S. Global Change Research Program, "Global Climate Change Impacts in the United States," Thomas R. Karl, Jerry M. Melillo, and Thomas C. Peterson (eds.). New York: Cambridge University Press (2009): 27–40, http://downloads.globalchange.gov/usimpacts/pdfs/climate-impacts-report.pdf. 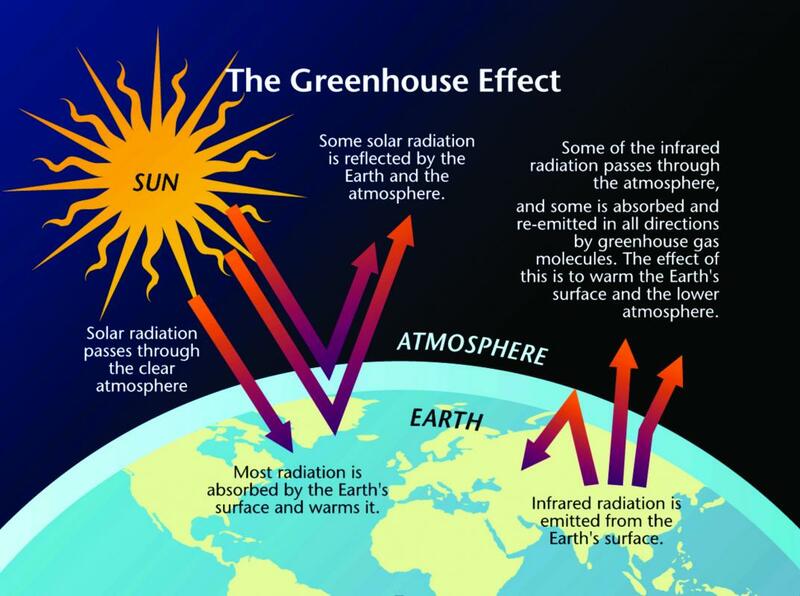 The Greenhouse Effect: U.S. National Assessment of the Potential Consequences of Climate Variability and Change: A Detailed Overview of the Consequences of Climate Change and Mechanisms for Adaptation. Global Average Temperature and Carbon Dioxide Concentrations, 1880-2004: UNC Asheville's NEMAC, adapted from a graphic design by Michael Ernst, The Woods Hole Research Center. 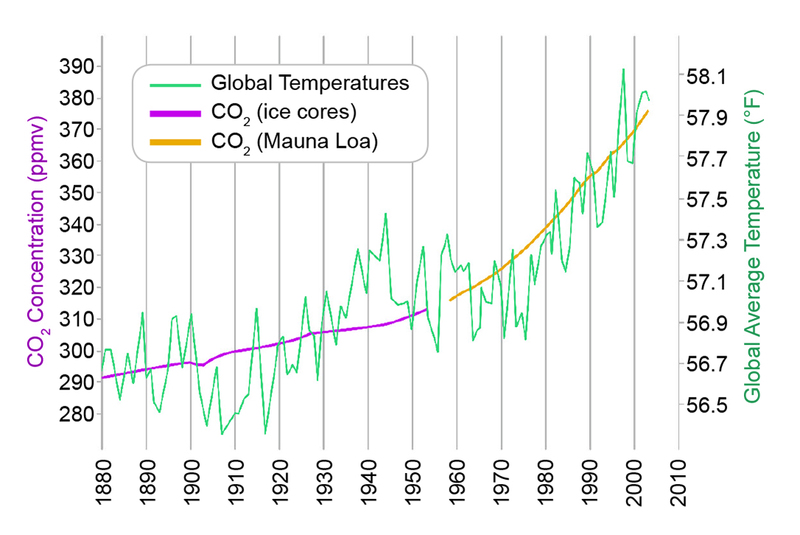 Data sources for this graph—Temperature: NOAA's National Climatic Data Center; CO2 (Siple Ice Cores): Carbon Dioxide Information Analysis Center; CO2 (Mauna Loa): Carbon Dioxide Information Analysis Center.